2016-17 was a much tougher year for the fashion/apparel industry. Renewed pressure on prices from growing low price chains and e-commerce, and ongoing tougher trading in regional areas, meant a culling of small regional stores, and depressed sales at department stores, resulting in a shrinking of the overall market. Corporate specialty retailing continued to be resistant to the fall, however, growing once again, especially low price chains and premium mass market retailers – and what both have in common is great value. Isetan-Mitsukoshi has just completed a significant u-turn by announcing the closure of its Isetan Matsudo store next March. It sacked its previous CEO for suggesting that Matsudo and other stores should be closed, but after attempting to get city hall to pay to keep the store open, the new management is now also facing up to reality. More stores are likely to close later too. Start Today expects to hit gross transaction values of ¥270 billion this year, making it one of the top five fashion/apparel retailers in the country, and surpassing the apparel sales of all the major department stores for the first time. This is a remarkable achievement for an online mall, but Start Today is expected to become much more than that in the next year, with plans to launch a major private label brand of its own that could mix elements of Uniqlo, customised clothing, and on-demand production systems. It could cause a shake up in the fashion industry, and lead to a boom in customised fashions. J Front is investing further in its Parco chain of fashion buildings. As well as opening a new Parco in Ueno in November using a new brand Parco_ya, it announced that Parco will become the main tenant in a ¥4 billion rebuild of the North Annex of Daimaru Shinsaibashi due for completion in 2021. Investment in other buildings is ongoing, and this month will see the completion of a two year upgrade to Parco Chofu. Following the announcement of several store closures last month, Sogo Seibu has now reopened a new annex to its key Sogo Chiba store. The annex is more SC than department store, and could well signal the direction Seven & I plans to move with its other properties. Seven & I will extend its Omni7 online sales portal beyond its own brand stable beginning in November. Called Omni Mall, at launch the new virtual shopping centre will host nine brands, including three services. Japanese shoppers already have access to a wide range of digital currencies from NTT Docomo’s mobile wallet technology to Apple Pay and Google Pay, but cash remains the dominant payment option. With overseas firms muscling into the market with their own systems, major Japanese banks have now won government backing to develop a new, standardised digital payment system and plan to have it operational by the Olympics. Aeon has had a difficult few years, with excessive costs and problems revitalising its GMS operations. 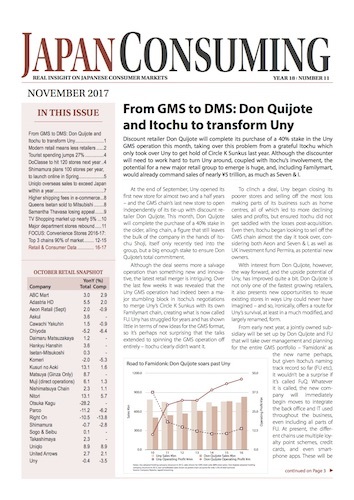 Aeon Style was introduced in 2015 and, along with some high profile price promotions, this now seems to have led to some improvements in finances, with losses at the GMS chain down by two thirds. Drugstores also continue to perform well. Yamato Transport and Amazon have been embroiled in negotiations over a new price structure for the past half year after Yamato finally admitted that it, and more importantly its drivers, could no longer cope with the relentless increase in parcel volumes. Amazon remains Yamato’s single largest client, but the online retailer plans to use a new partner to deliver in Tokyo, using Yamato and its rivals for other parts of the country. The two firms are reported to have agreed a price increase likely to average around 40%. Japanese online shoppers appear to be more forgiving and less inclined to return purchases compared to UK shoppers, according to a new survey from JDA Software, but Click & Collect services are still barely used compared to other markets. Store saturation and, in the past few years, the rise of new, lower priced coffees from chains like Seven Eleven and McDonalds, have eaten into Starbuck’s growth. In response the company introduced an unusual loyalty programme last month, offering both standard and premium membership tiers. Sports manufacturers and retailers are struggling amid a downturn in spending on sports apparel and equipment, but those better placed to serve the booming sports fashion and sneaker market are enjoying strong sales growth, which means opportunities for international sports brands. Laox, the duty-free chain targeting Chinese tourists, has gone from short-term success back to large losses in just the past two years. Last year it snapped up a bankrupt local shoe wholesaler, hoping to revitalise sales, but tourists remain uninterested. It has now announced a further acquisition that will make it the single largest women’s footwear supplier in Japan, but whether this will help revive its core business remains questionable.